Mommies’ 60-day Relationship Transformation program! Check out Bette on YourTango! "Helping families successfully balance the joys and challenges of family life"
Are you worried that your kids aren't respectful? 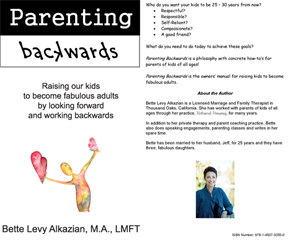 Through private sessions, teleclasses, parenting parties and speaking engagements, parents all over Southern California are learning about the "Balanced Parenting" methods of raising great kids to become great adults. Welcome to the world of Balanced Parenting!